Do you want to burn fat faster and lose belly fat? Consider “taking a break” in your cardio exercise. Many, if not most Companies provide breaks for their workers throughout the workday. These breaks allow employees to take their minds off their daily tasks and relax for a period. These breaks help the workers maintain a higher level of productivity throughout the workday. For many of us, doing cardio exercise to lose belly fat is a lot like work. We dread the 30 of 40 minutes on the treadmill or elliptical trainer trying to burn fat. In order to break up the monotony, we often play the latest hits on our iPods, or watch television, but even that can only distract us for so long.We have often heard that in order to burn fat, we should perform cardio exercise continuously for 20 minutes or longer. This may not be the case. If we apply the principles of taking breaks in business to keep productivity higher to our efforts to lose fat through cardio exercise, then it may make sense to split up our cardio exercise to burn fat faster. One very effective way to split up cardio exercise and lost belly fat faster is by using intermittent exercise. In a study published in Medicine and Science in Sports and Exercise, people who broke 30 minutes of cardio exercise into three 10 minute sessions separated by 20 minutes of rest reduces fats in the blood more than people who exercised continuously for 30 minutes. Reducing fat in the blood will help you to lose belly fat. The key, according to the study, is to make sure that you exercise at a moderate pace – a leisurely walk around the block will not do. You have to perform each 10-minute bout of cardio exercise with the same level of intensity as you would if you were exercising for 30 minutes continuously.So how did the continuous cardio exercise group compare to the intermittent cardio exercise group? We can see in the graph below that total calories burned between the two groups were approximately the same, while the perceived exertion for the intermittent group was lower. 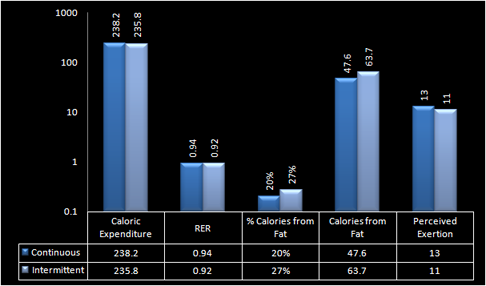 Also, by using the respiratory exchange ratio (RER), we can use the table at the bottom of this page to determine that a greater percentage of the calories burned were from fat for the intermittent group. That is good news if you are trying to lose belly fat! The conclusion here is that if you want to lose fat faster, an easy solution may be to “take a break” in your cardio exercise routine by breaking a longer workout into shorter intervals. You will burn approximately the same number of calories, but more of those calories may come from fat. So take a break and lose belly fat! Don't Forget: Break up your cardio exercise routines and lose belly fat faster!